Reykjavík City is Age-friendly and takes into account the needs of senior citizens and what is accessible and suitable for them. The aim of Reykjavík City is to find ways to further support their senior citizen’s participation and their efficiency. There are many factors to consider to increase the quality of life of senior citizens. It is important to improve transportation, provide cheap access to gymnasiums and swimming pools.The Mayor of Reykjavík appointed a working group on 23. October 2015, whose goal was to improve the health of senior citizens in Reykjavík and to increase their activity and improve their quality of life. Increased age can have profound effects on people’s health but many of these changes are preventable.The work group believes physical exercise, good nutrition and social activities are the best ways to prevent lack of physical and mental health.According to the group’s report senior citizens often need more motivation and support than others to exercise but they often do not use the available services or have the money to pay for it.It is very important for senior citizens to have immediate access to good facilities for physical exercise and to start exercising before their health deteriorates.The City Council in Reykjavík has agreed that from the first of June this year all those who are 67 years of age and older will have free access to all swimming pools in Reykjavík following the work group’s suggestion. The City Council encourages all to enjoy the good weather this summer and go for a swim. Many older people enjoy to go swimming every day. 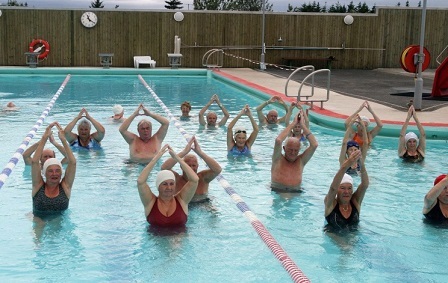 In some swimming pools there are gymnastics for senior citizens which are well attended.